I’d like to file a complaint. Somebody has stolen all of the sunshine. If you’re from a place where spring actually feels like spring, and summer looks like–well, like it’s supposed to, this is saying a lot. Thing #1: It’s not spring-like everywhere in the spring. Cue multiple photos of me wearing 2 thick sweaters, 2 heavy coats, 2 pairs of gloves, knee-high socks, and boots the size of an overgrown sea elephant while waddling (much like a sea elephant) around the entire city trying to peek out at touristy attractions like the Bean without disturbing my puffy scarf and beanie. Yes, the Chicagoans were visibly laughing as they passed by in their t-shirts. I would’ve done something about it, too…if waddling over to punch them in all my ridiculous layers didn’t make it look like I was just getting ready to give them a big bear hug or something. Thing #2: As much as I told myself I wouldn’t be a pansy and say it’s “freezing cold” anymore when it’s, y’know, not…The lack of sunshine around here is killing me. On my last day in St. Louis, it had warmed up to the point that I was eating renowned frozen custard from Ted Drewes wearing a tank top and a light jacket. Today, I had to wear a thick jacket. Nuh-uh. Uncalled for, Cali! So that’s what these brownies are for. Some people like to do rain dances. Since it’s been a dark, cloudy, overcast, likely-to-pour day over here, though, I huddled up inside with my books and made these gorgeously dark black sesame brownies and decided to throw in a bit of sunshine. Then do a little dance. The sunshine brownie dance. Because they’re really, really yummy and super bright! You’ll love the smoky (and healthy!) taste of black sesame topped with the tangy bright taste of lemon curd sunshine. I’d have to say April 25th. Because it’s not too hot, not too cold, all you need is a light jacket. I’d love to hear what you’re thinking! Thanks for stopping by and taking the time to read/comment/follow. I hope you’re enjoying the weather and/or the indoors, wherever you’re at! Preheat oven to 325 degrees F. Lightly grease a 9×9-inch baking pan and set aside. 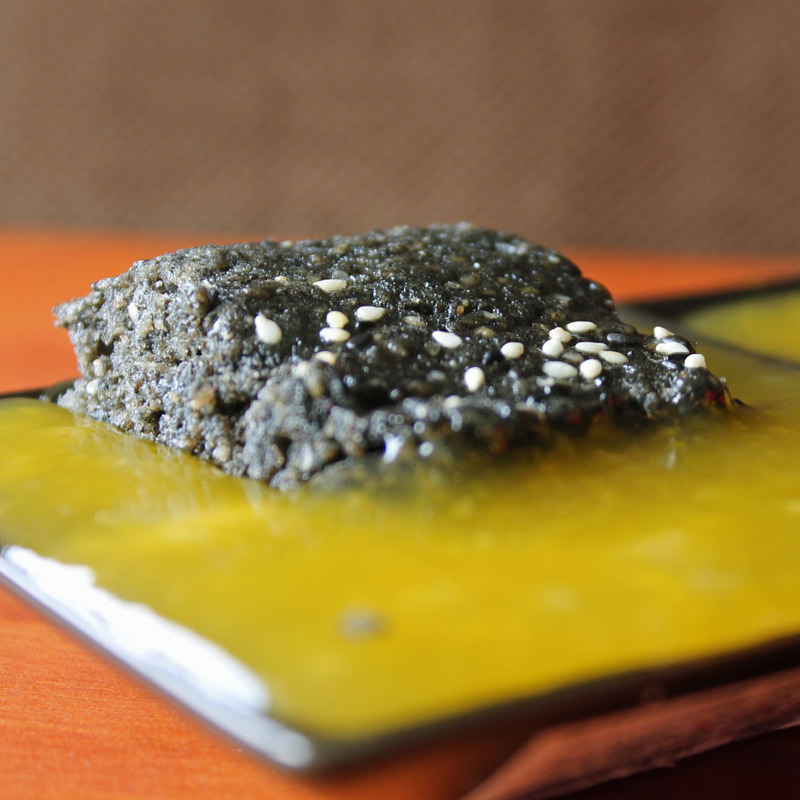 In a food processor, combine melted butter and black sesame seeds. Grind until it turns into a fine or slightly gritty paste. 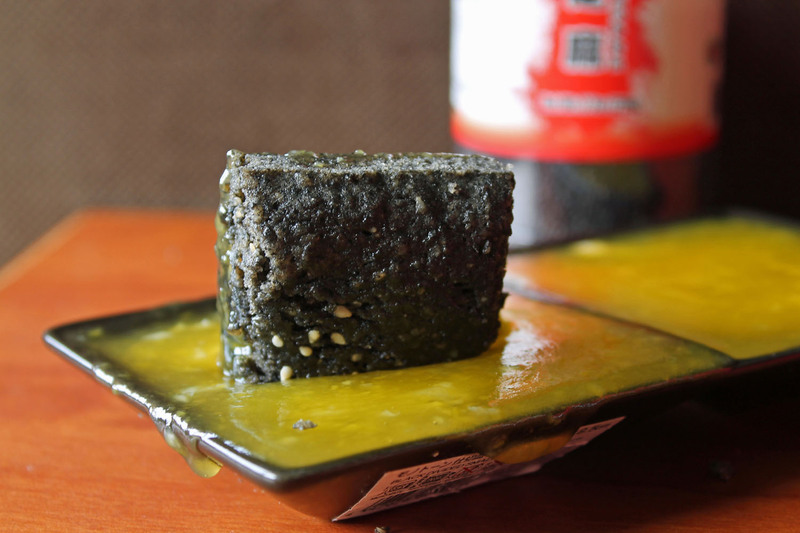 In a medium saucepan over medium heat, combine sesame paste, sugar, and soy sauce. 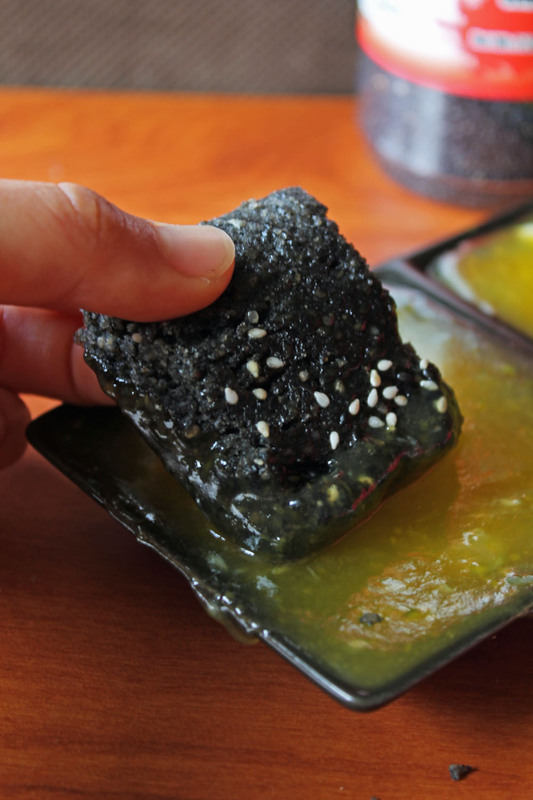 Fry it for 2-3 minutes, or until the black sesame becomes smoky and fragrant. (The oils will start to separate when it’s ready–be sure not to overfry, otherwise you’ll burn your sesame!) Remove from heat and set aside to cool. Add cooled sesame mixture to a large mixing bowl. Mix in eggs one by one. Gently fold in flour until just incorporated. In a large microwave-safe bowl, whisk together sugar and eggs until smooth. Stir in remaining ingredients, then heat in microwave at 1-minute intervals for approximately 4-5 minutes total, stirring between each interval. Your curd will be ready when it’s thick enough to coat the back of a metal spoon. Remove from microwave (straining out any excess egg whites as necessary through a mesh strainer) and allow to cool slightly before serving. Sunshine, order’s up! Great looking brownies – they look seriously good. Winter has been dragging on here – but it’ll be in the 60s this weekend, so life is good. 😉 Glad you had a fun time on your trip, even though the weather was cooler than it often is at this time of the year (although you can still have really cold weather in Chicago in May!). It seemed to be warming up when I left–I hope you’re getting some sunshine now. Chicago was still too chilly for my taste! These brownies are so unique! And it’s true, it has only been sunny one day this year. I thought they were such fun when I saw them, too! I hope it gets sunny soon in your parts–thanks for taking the time to stop by and comment! Love the color of these! And I never would have thought to dip brownies in lemon curd, but I have to try it now the next time I have brownies around. Genius idea! Thanks, Eva! That’d be such a nifty tangy combo for brownies too…hope you do get to try it. Thanks for taking the time to drop by! I’m totally on board with your sunshine brownie dance. 🙂 And this recipe! Thanks, Sally–it’s not sunny enough for my taste so I was doing it again today 🙂 yum! Love this post and recipe. Thanks for sharing. I love black sesame anything, especially ice cream. 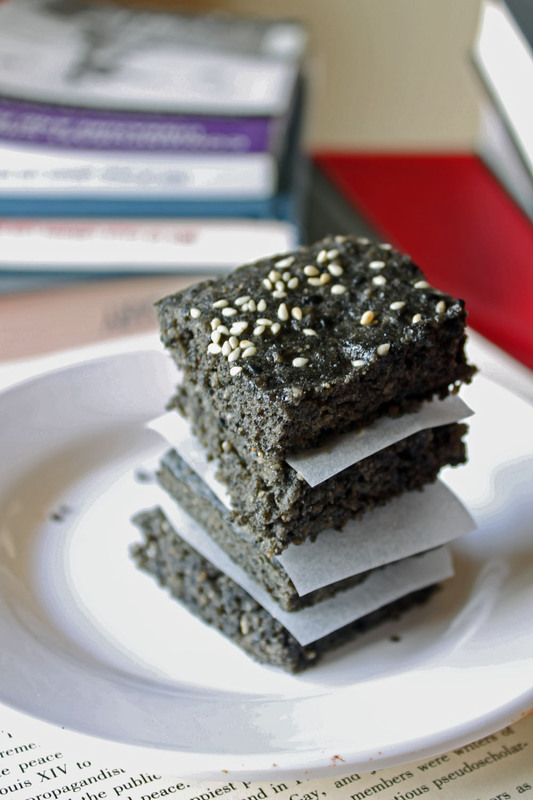 But today I came across a black sesame brownie and I’m in love. The base was much like a chocolate brownie but the rest sesame. It was topped with an apricot and it’s glaze. Delicious. I found it at Cedele, here in Singapore where it’s always sunny. And I hear you on the cold. I just got back from USA, east coast and I missed the sunshine and greenery. Even though I lived there not so long ago, I think I’m a tropica kind of gal.